First published March 15, 2014 , last updated March 26, 2019 . Reading time: 3 minutes. 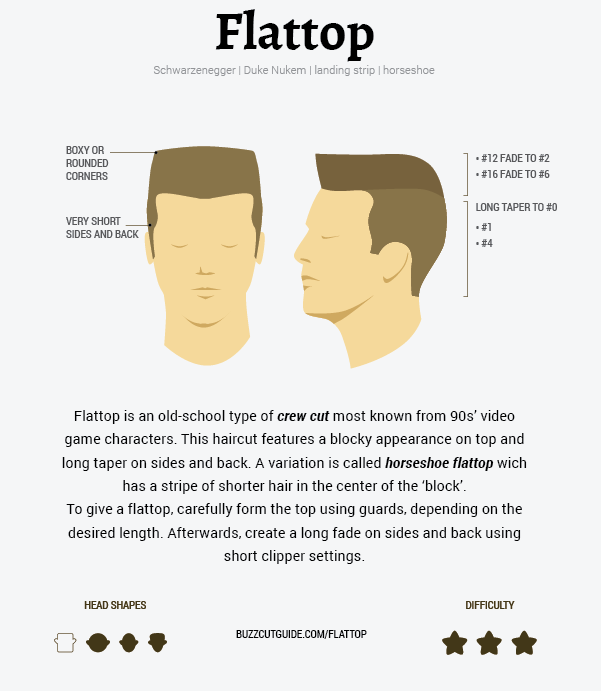 Flattop is an old-school type of crew cut most known from 90s’ video game characters. 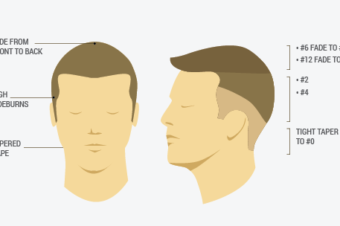 This haircut features a blocky appearance on top and long taper on sides and back. A variation is called horseshoe flattop which has a stripe of shorter hair in the centre of the ‘block’. Here we’ll show you how to do a flattop and hope to inspire you to do one of the boldest haircuts out there. Decide on whether you want a ’rounded’ or ‘boxy’ flattop. Browse though a few photos of the haircut so you get the feeling of what you want. A rounded flattop will give you a more robust look, whereas a boxy flattop looks more casual. Consider your facial features, too. If you have a square face or jawline, a cut like this will only accentuate those features. Opt for a ’rounded’ cut that will smooth your bone structure and suit you better, instead. Even though the steps to follow are few in number, you need to be very precise and patient in very step of the way. First, start by cutting the sides and back using the standard guard sizes for crew cut. Alternatively you can create a long fade (by using short settings on clippers, ex. from #1 to #0). Be careful to cut hair on sides in an upward manner. Do NOT follow the shape of head during the process – as you go up with the clippers, drag them up and away from your head. That way you give shape to your cut and create more contrast in your cut. When you’re done with the back and sides, you’re ready to start shaping the top. You need to be very careful when performing this part on your own head, as it requires a still hand. If you can, get someone else to do it for you. If not, keep a second mirror near by to assist you. Comb your hair upwards, creating more volume and giving you an idea of how the hand will stand up once you finish. Carefully form the top by using guards, depending on the desired length and the contrast you’re looking for. The length should fade from longer to slightly shorter as you near the crown. When you finish with the clippers, grab a pair of scissors to help shape the top or to do the last touch ups. 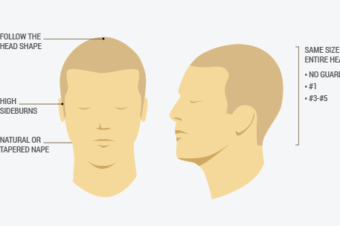 Again, if you have a square jawline, avoid a very boxy top by doing a longer fade to smooth your facial features. 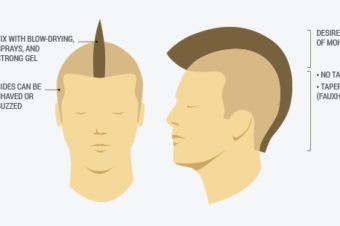 How to style a flattop? While a flattop is quite a difficult cut to master on your own, styling it is relatively easy. After cutting your hair, wash it and blow dry it upwards (similarly to how mohawk is being styled here). Then, rub some hair wax making a square shape and you’re good to go!